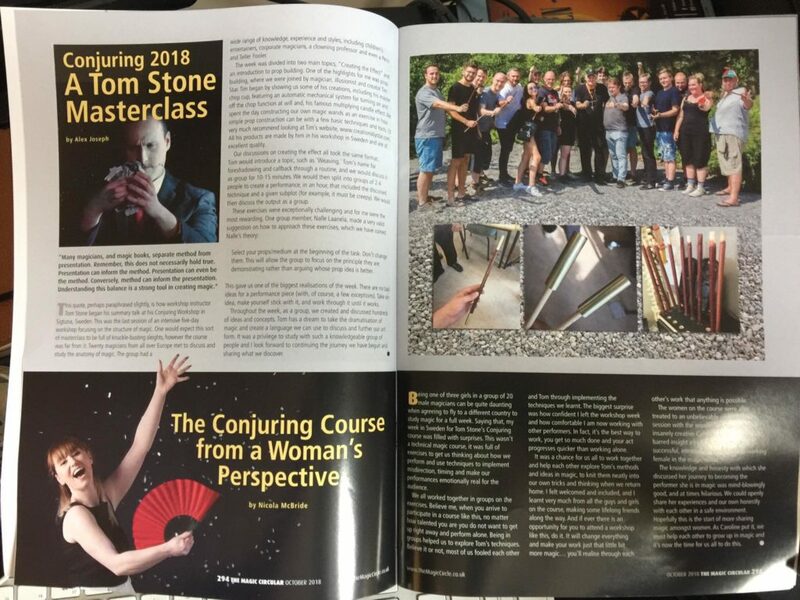 The path that brought me the opportunity to attend and complete Tom Stone’s Conjuring Workshop in Sweden this July 2018 was, in short, the most surprising and magical journey I have taken in my career as the only female professional magician in Ireland so far. I met Tom when he was performing at the Session Convention in January 2018, where he told me that he was planning to run a week long magic workshop in Sweden in July for magicians to attend. At that point I thought that this was the most exciting thing I had ever heard. Tom may as well have said that Hogwarts was real. I immediately asked could I attend and after some rescheduling of work on my part I jetted off to Sweden with the fear of god in me that I, a small girl from Belfast was about to study magic with these world class magicians. The attendees were from Sweden: Hanna Günther, Nalle Laanela, Erik Nordvall, Stefan Eriksson, Lenn Hardht, Anders Björkman, Niclas Jacobsson, Martin Nilsson, Simon Söderqvist, Vilhelm Boman. …and me Nicola McBride from Ireland. 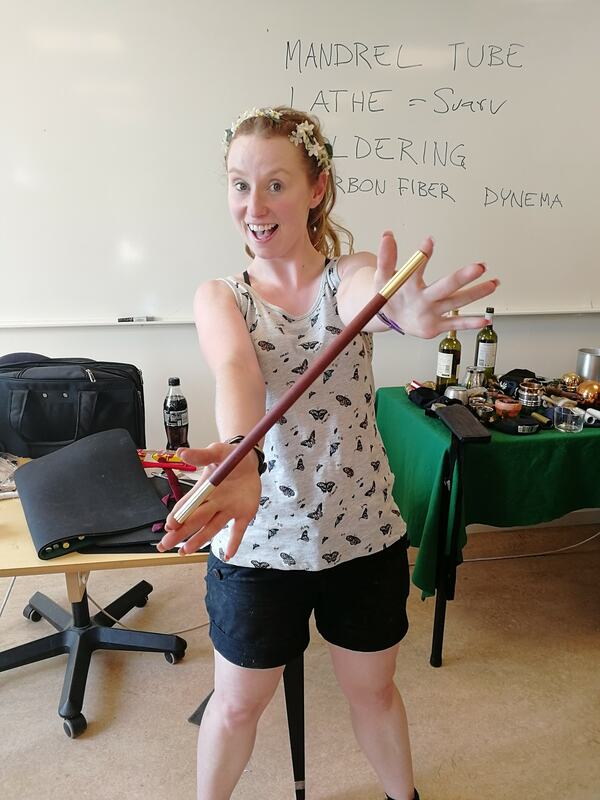 Set in the beautiful countryside Sigtuna Sweden, the course was held at Sigtuna folkhogskola, an educational training school where they offered courses such as photography, painting, fine art and this year, the Conjuring course. The course itself cost wise was amazing value for money as it was free. Yes you heard me right, free. All that had to be paid for was the accommodation and food. The venue was spacious, set in a forest surrounded by trees and nature. We all sat outdoors most days in the sun eating our meals together including fika which is a Swedish traditional coffee break where hot drinks and cakes are eaten whilst creatively discussing the day’s work. The food here was delicious and traditional, I was glad to see that Sweden appreciate potatoes as much as the Irish do. And to top it off the people attending the courses were lovely too. Being able to finish a working day of Magic and go swimming in the lake made this setting just magical. It felt like I was at the best summer camp ever. Upon arrival, my excitement for being in Sweden turned quickly to fear. I was completely overwhelmed. When I met all the other students on the course in Stockholm for drinks the night before the course began, I seen just how talented everyone invited on the course was. Showing off their magic tricks easily and proudly set my nerves on fire that night and with that the anticipation of having to actually attend the course the next day and compete with this talent got the better of me. I cried. Loads. I wasn’t sure if I was ready to face being a part of something so big. What had I to offer at this course magically to others? However a motto of mine is that the show must go on and the next day I walked into the workshop room ready to participate. My fears of attending the first day (which I found out everyone had too) were immediately wiped away. We began as equals thanks to Tom making us all agree that just for this week, there were no female or male magicians in the room, just magicians. Also that we were not allowed to have wizard battles displaying our talent and skills. As I come from a performing back ground (I got into magic training as an actress), this was a joy to hear as I don’t necessarily have a huge magic skill basis, but I have a great deal of theatrical knowledge. The pressure to show off and perform was immediately lifted from us all so that real magic could happen in the space. Over the week each day consisted of workshops, exercises, performances and discussions. I must admit that never before had I openly talked to other magicians in the way I felt the group talked about magical performance and technique over the course of the week. This is something that needs to be done more in our magic communities globally. Tom facilitated through exercises, individually and in groups how to create something original without aiming to be original. For example when you’re handed an invisible coin to vanish perhaps you should not just be thinking of the method but be thinking how does it actually vanish? What do you see happen? How does the coin feel when it disappears? How do you feel when the coin is finally gone? Did you make it happen or not? By creating a narrative in magic we provide a believable focus to our audiences, in turn we can then create gaps for many misdirection techniques that Tom explored with us across the week. My favourite techniques from the Conjuring Workshop were the ones focusing on memory. The thinking that the brain does not truly remember all it sees. And the importance of where to look. I learnt that if you want someone to look at something you need to look at it. And if you want someone to look at you, you need to look at them. This became a powerful tool within the course. In groups we worked together every day creating short performances that showcased Crossing the Gaze, sub plots in Magic, counter motions, one ahead principal and one behind, shadowing and cancelling. Working together on each challenge was the best part of the week. It was evident that we as magicians mostly work and develop alone so you realise quite quickly that through working with others, if you get up on your feet and brainstorm together a lot can be created in a very short space of time. I was so proud and surprised that for one of the challenges we were set which was to move an object from one side of the stage to the other without anyone seeing it, that my group completely fooled everyone just by using all the techniques mentioned above. I learnt to trust in the techniques. Even if you don’t necessarily feel they work, they do. Another sheer joy on this course was getting to meet and create props with the wonderfully talented and creative mind that is Tim Star. Tim helped us all make a match lighter and, a Magic Wand from scratch. I kid you not, we sliced, diced, soldered, lathed, painted and polished to perfection an original magic wand of our own. It sounds complex but trust me I am the most accident prone person in the world and I survived thanks to Tim’s guidance. For me making my own magic wand was one of my most proudest moments yet in magic. It should be compulsory for every magician to make their own magic wand. As if all the above wasn’t enough in this magical week we had some underground masterclasses in the evening to top us up including Caroline Ravn who provided a no holds barred, insight into how to become a successful, professional working woman in Magic. John-Henry from Mystique came and gave us a lesson on 3D printing and it’s uses in Magic for making specialised props. And Ondrej Psenicka gave us a masterclass on his beautiful butterfly playing cards. Tom really thought long and hard about what he wanted to put into this workshop for his pupils because sincerely it was awe inspiring. The magic just kept on coming and he as a teacher kept on giving. I think this is a shared experience that we will all bring with us in our magic careers the rest of our lives. As the week came to a close, and we got more comfortable with one another, I felt for the first time in magic that I was an equal in the room. Me, an equal to magicians who are so talented, kind and sharing. The Conjuring Workshop and all the participants showed me what magic should be. What magic could be. A creative explosion of genius, trickery and madness that when explored together is so much fun. Ending the week by performing a solo routine on our own, implementing all the effects across the course was the perfect finale. Working together in groups we helped shape and mould each others acts, improving techniques and hiding sleights. For me, it was a real achievement to stand up in front all those magicians whom I now call friends and show them what I could do after my journey on the course in Sweden. I began this course thinking I am just one small girl in Magic, insignificant and how was I ever going to survive this week of Magic. I left the course feeling not just a small girl in Magic. I felt accepted. 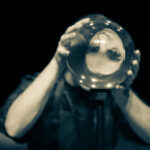 I felt like a real Magician and performer. I left feeling taller, braver and that anything is possible in my Magic career. I feel my magic future is bright and now thanks to the course I’m open to every surprise magic throws at me. Thanks to this course I’m ready to create beautiful magic for the world. This have been the best and most inspirational week of my whole life. All my performance anxiety disappeared! The atmosphere in the workshop was so friendly and encouraging that my performance anxiety disappeared. The workshop coaxed out a joyful creativity and spontaneity that I didn’t even knew I possessed!